How do you classify a hall of famer recognized as one of the top 50 of all time as under-rated? I think this might be generational like ding of a certain age and not knowing who Jimmie Foxx was. 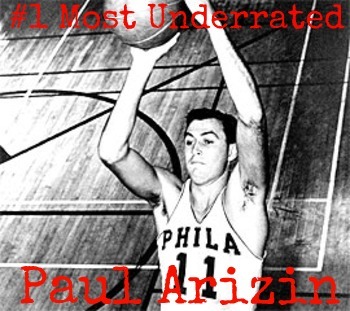 Paul Arizin: how can a true superstar be so underated? The sudden death in 2006 of the former Philadelphia Warriors (NBA) star, Paul Arizin, was simply put, both a shock and quite unsettling to me. It occurred not long after I had a long luncheon with Paul at one of his favorite eateries just outside of Philly. Along with the sorrow, many thoughts raced through my mind about Paul and one seemed to resonate; one that I had many years ago. While he seemingly was recognized as a great player, to me he was not really seen for all that he was…where was the ink about him during and after his career? This article began partly from a memory of a 1950’s game at the old Madison Square Garden in NYC between the Philadelphia Warriors and the St. Louis Hawks…and the media write-up. Arizin has what could be called a perfect 10: 10 field goals in only 15 attempts; 10 free throws in 11 attempts and 10 rebounds (aside: for 8 of his 10 seasons, he finished in top ten of the NBA in free throw percentage). Well, the Warriors lost a close one in which Bob Pettit out-scored Arizin by 1 point; 31 to 30. Pettit’s 9 field goals were on 20 attempts and his 13 free throws were on 16 attempts. The newspaper’s headlines? Pettit leads Hawks over Warriors. Arizin? He got an acknowledgement late in the write-up that he led the Warriors in scoring. That stuck in my mind because he played a dynamite game and was barely mentioned. This memory stayed with me and seemed to be at least somewhat true throughout his career, great as it was. While doing some editing of this article, it really hit me: Nowhere did I find in it what really pushed me to write it. Thinking about it now, it was a combination of disappointment, anger and puzzlement. It is 50 years since Arizin last played in the NBA and 9 since he died. My same question still stands: why so little ink on him during and after his career? Why so little recognition of a player who was partly responsible for changing the way the NBA game was played? Why lately do we see some pundits and “amateur” statisticians writing books that re-calculate the stats ( by their techniques) and worth of players, some suggesting that 1. Arizin was the last player to make the NBA’s 50 all-time greats and he should not be there and/or 2. He was good, but not that good. And, he did not invent the jump shot nor did he really revolutionize the game. An aside: how many of these writers regulary, or if ever, saw Arizin play at his prime or are their opinions based on old film clips, mainly of an Arizin may not have been the Arizin some of us saw from the early to middle-1950’s? Let’s begin about the “invention” of the jumper. 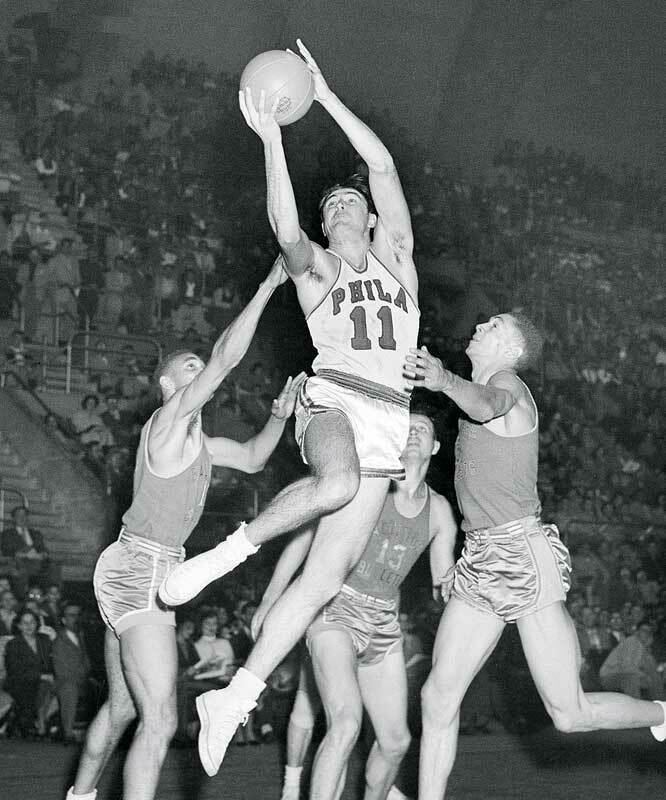 To be sure, in late 40’s and 50’s, there were players who shot the jumper…Belus Smawley, Buddy Jeanette, Kenny Sailors to name the three most referenced. These were all guards, about 6′ tall and who averaged about 12 ppg. What Arizin did was show that a deadly accurate jump shooter, with hang time, could lead the NBA in scoring..even at at an undersized 6’4″ with double the scoring of those of those mentioned. Throw in Bud Palmer if you want; same size as Paul but 14 ppg was his record. Moving on: in 1950/51, the NBA played a slow, deliberate game; the norm was 2-hand set shots, hook shoots by some and layups, some using 2 hands, the occasional tap-in or putback of a rebound from about 2-4′. Team scoring was low; 70-80 ppg was the norm. Big men, especially Mikan, hovered near the basket for reboulds, tip-ins and 3 foot put backs, albeit George could hook well with either hand. Field goal shooting percentages were around 34-36%…or lower. Along come Arizin, showing a great, one-handed jump shooter who got few tip-ins, could lead league in scoring and shoot over 40% from the floor. That fact opens up the game, begins to unclog the middle and starts the NBA on the road to the jump shot as the prime offensive weapon. For those who would say the 24 second rule opened up the game..yes as to stopping a team holding the ball once they had a lead and the resultant low scoring and fan boredom. BUT that rule it came 5 years after Arizin came in the league and 2 years after he went into the United States Marine Corps (USMC); more later on that. Going back to the lack of ink: we have many books/book chapters/articles about legends such Cousy, Schayes, Russell and a few others from that era; some are still being written. We do not have a single book on Arizin. Was he too damn consistent? (my personal belief ). Not flashy enough? (that one does not hunt: he was as dynamic and athletic..and a skywalker.. as one could ask for). Why is he not seen and recognized for his achievments and his impact on the game? Other questions: What really was his impact on the game?…remembering that his career overlapped that of the Big O (Oscar Robertson) and Elgin Baylor. These 2 players are seen as propelling the NBA into the more modern era. And, so many of Basketball’s Top Fifty players were playing, as was Arizin, in the 1950-1970 era? Has Paul been somewhat overlooked and underated? Before the reader dismisses this idea out of hand by saying Arizin had an illustrious career, that in college, he lead all major college scorers as a senior; was consensus first team All-American and both The Helms Foundation and The Sporting News “player of the year” in 1950. That as a pro: 10 times All Star; 22.8 points per game (ppg) lifetime average with a 24.2 ppg playoff mark; first NBA player to average over 20 ppg for 9 straight years; scored 10,000 points (then a benchmark achievement) faster that anyone of his era..faster than Mikan, than Cousy, than Schayes; 2 NBA scoring titles; finished second in scoring two other times (three times by some statistical accounts); selected to the 25 year NBA Silver Anniversary team of only 10 players and, later, to the NBA 50 all-time best group. Besides, nowadays, the game has evolved into a high-scoring one, with standing jumpers from the perimeter (just outside the 3 point line), acrobatic dunks, often following a pass to a player who has leaked out…we would have said snowbirding or basket hanging the old days. 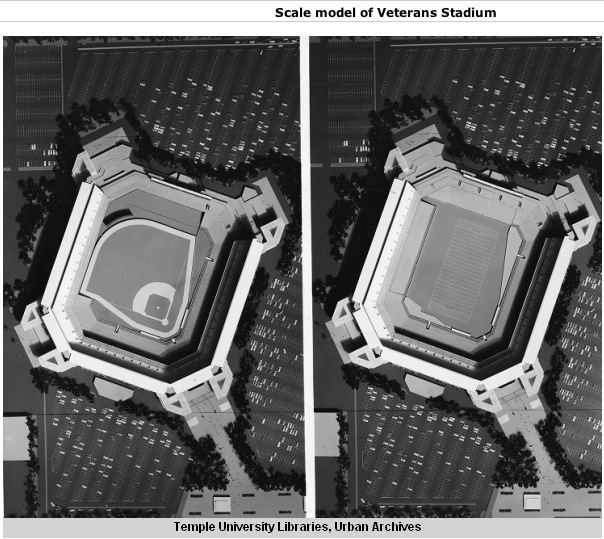 So, why bother with a re-look at Arizin? Before that facile dismissal comes up, let us instead look at Arizin’s career, year-by-year, with some commentary. And remember that the bible of sports, now defunct except as a digital publication, The Sporting News had an extended article in 1992, asking who in the 1950-early1960’s era could have played in the modern NBA? Only Russell, Schayes, Pettit, Cousy and Arizin. I believe we need to look much more carefully and deeply at his career. Arizin broke into the NBA in its infancy, 1950-51. This was an era of 2-hand set shots, low scoring games as there was no 24 second rule with teams averaging in the 70’s-low 80’s ppg. He brought in the one-handed jump shot with what we now call hang-time and the game began to open up. So what? Averaged only 17.2 ppg as a rookie, but still good for 5th in the league. Let’s look deeper. First, Arizin had not finished his college degree due to changing his major when he began playing for the Warriors. But, indeed he did finish it his rookie year by attending classes during the NBA season, making his own travel arrangments (remember, air travel then was not the norm, so we are speaking trains and busses) and only missed one game. He also played with Joe Fulks who took almost 500 more field goal attempts that Paul that season, while making only 72 more field goals and shooting only 32% from the field. Arizin shot 40.7%, good for 7th in the league. In fact, the 2 starting guards for the Warriors took about 700 shots each compared to Arizin’s 864 fg attempts. Paul showed his leaping ability and toughness getting almost 10 rebounds a game; 8th in the league. The 2005 TV series, “NBA basketballography”, has a program on Arizin. He was alive when it was made and he made 2 interesting points: He hated the nickname “Pitchin’ Paul ” as much as he said Wilt Chamberlain hated “Wilt the Stilt.” If the players ever called him anything, and mark this, in his first two years in the league, some called him “The Leaper.” If you saw him in those two years, when he was really slender at about 185 pounds, he could jump out of the building. Action pictures of him in his last year at Villanova show him to be a real skywalker. We will return to his jumping ability later. To resume: the icing on the claim Paul could have high a higher scoring averge were the playoffs where he clocked in with 20.5 ppg and 10 rebounds per game. It would not be unreasonable to say 20.5 ppg would have been his season’s average..this would add 212 points to his all time total. In his second year, Arizin lead the league both in scoring at 25.4 ppg and field goal (fg) percentage and was 6th in rebounding at 11.5 per game; proof that his first year was not what it could/should have been …and his 25.7 ppg and 12.7 rebounds per game in playoffs solidify that claim. The jump from 17+ppg to 25+ ppg was partly because he was now the Warriors first option; partly due to Joe Fulk’s sudden decline, although Jumpin’ Joe stll took 1078 shots to Paul’s only 1,222! This year should have been the portent of scoring championships to come. But, the next, and final, NBA scoring championship for Arizin was 5 years in the future. Why? He spent the next 2 years in the Marine Corps. As many have noted, these should have been 2 of his most productive years, looking at his big impovement from his rookie to his sophmore year plus, he is only 24 years old. And now comes the really interesting projections. On the low end, averages of 26 and 26.5 ppg seem accurate for these two years had he not gone into the Corps. The NBA season had expanded from 66 to 72 games and Arizin always was a workhorse for games and minutes played…so let us say he played 70 games in each of those 2 seasons; giving him 1820 and 1855 more career points. As an aside: during one of our talks, I asked about his missing those two years when he was young and at the top of his game, those 2 years he was in the Marines. He had no regrets, no “what ifs”…instead, he was proud to have served his country, especially proud of being a Marine. One wonders what some of today’s stars would have thought about losing 2 of their best years to military sevice? On to his first year back: In 1954/5, he averaged 21.0 ppg, was heavy, at at least 215 pounds (versus about 185 when he left the Warriors in 1952). And, when the season began, was rusty, out of shape and got that many points because he was playing himself into shape. He lead the league in minutes played; took a lot of shots…in fact lead league in field goal (fg) attempts…not at all his norm. But, his fg and free-throw (ft) percentages were down from his sophomore season…and, he was playing with league’s leading scorer, Neil Johnston. In spite of Paul and Neil’s scoring, Warriors finished dead last. This soon changed, however. On the plus side, Paul placed second in the league in scoring and got over 9 rebounds/game. He did now have a deadly one-hander from 15-22+feet which he did not really have? use? 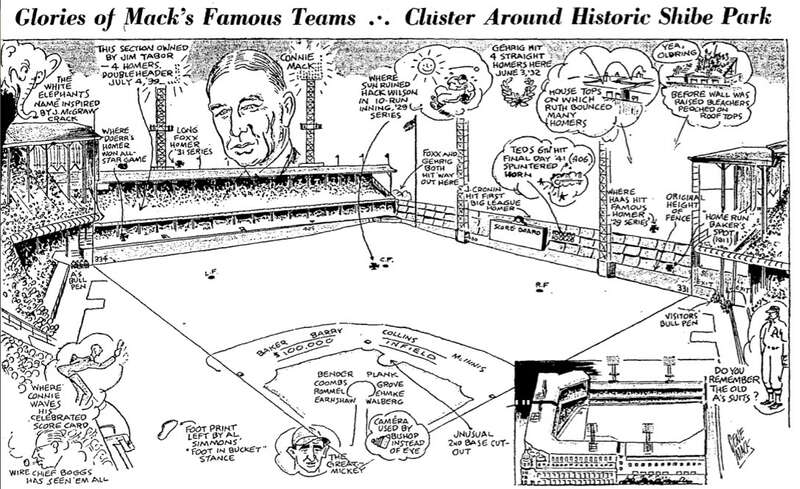 prior to the 1954/5 season. I recently saw 2 books (after I wrote this article) which stated that, in his first year back from his military service, he indeed was out-of-shape. Further, had he not lost those to years in The Marine Corps, he probably would have won 2 or 3 MORE scoring titles (for a total of 4 or 5 for his career). He also would have ended up with a much higher lifetime ppg average. His total soring titles would have placed him in lofty company; with only Jordan and Chamberlain. In 2015, we need to add Kevin Durant BUT, Durant, like Jordan, played/is playing in the 3 point shot era and both, especially Durant are good 3 point shooters. Before people say “enough, too many statistics.” Much of what I write comes from two sources. There are my memories of seeing him, from his rookie year on, many times. On TV; at the old Madison Square Garden (MSG) in NYC; at Convention Hall in Philly. I vividly remember the first time I saw him in person. It was a Saturday afternoon game at the old Madison Square Garden against the NY Knicks. The circus was in town and there was aerial rigging, lots of wooden moveable seats, cotton candy sellers…my first time eating that sugary/sweet concoction. Arizin was on fire in the first half…jumpers, drives, even a baby hook; he scored 31 points and we were all thinking a MSG, maybe an NBA, one game scoring record. The second half begins; after about 1 minute, he walks to the sidelines and pukes his guts out.They take him out for all of the third quarter and he returns with about 8 or 10 minutes left in the fourth quarter. He does manage 8 more points for a total of 39…great game, but far from a record. Still, what a first half! Obviously one rationale for writing this was that, from that afternoon on, I became a really rabid Arizin fan; still am even years after his death in 2006. I saw him every time he played at MSG…student ticket prices were a boon…and remember, the NBA played double-headers back then and, every time he/Philly Warriors were on TV plus about 5 trips to Philly to see him play. I did not begin to play basketball until the end on 8th grade and I was entering HS. Played baseball, softball, what we called “fast pitching” which was played with thick broom for the batter and worn-down tennis ball, thrown at a chalked/painted-in strike zone on a concrete handball wall. Now, there was what we called a playground (all concrete) near our house..swings, slides , monkey bars, softball field and it had a full size BB court, with metal backboards. I had watched people, from my age to adults play there, so I had seen basketball played. I really came to like B-Ball and I played it all I could; after hours at HS; on the concrete playground court (not too much but enough that I take injections 2x/year for my knees and have 2 hip implants) and, at the local JHS/community center. I grew up in what would now be described as grey neighborhood and, if you wanted to play indoors, you had better be good enough to be picked at the local JHS/community center pick-up games. Fortunately, I could jump and was rough/tough going to the basket. As one black put it: “here comes Ron with his ‘get out of my way or get killed drive'”…and was developing a decent jump shot. At first, I tried to imitate Arizin’s signature jumper: slightly leaning back, with legs bent at knees and folded under. Could not quite bring it off as it required a level of coordination I had not achieved and was not my natural shooting motion. Once I began to focus on elevating, on trying to get seams at ends of fingers and on release, became a good jump shooter, long and short range. I played, over the years in many leagues and military service ball during a time where there was a draft and service ball was excellent. many college player were playing including a pro named Arizin. Be all of that as it may, I would never have been attracted to and worked so hard at developing a jump shot were it not for watching, and rooting for, Arizin. Over the next 3/4 years, I played in tough leagues, under many names I knew I had arrived when the local team, all black with one hispanic, asked me to play with them in a game against the Flushing YMCA. Then, all Y’s had teams and they were good! Was I nervous? You bet, albeit I was a tad cocky and sure I was good enough. I never played HS BB because the coach was also the football coach and wanted me to play football…no thanks! I closed that opportunity one day at the start of my junior year. The coach had played college BB in the 1930/40’s and had a killer 2-hand set, He was also short and had run to fat….he made fun of me in intramural games, saying I played a black (not the word he used) game and jump shots were BS, inaccurate and a losing way to shoot. One day, I said play me one-on-one after school and after all had gone home; “make it, take it”…to 30. Soon as he missed, it was over: I ran 25 straight, jumpers and drives…and being the arrogant teener, rubbed his nose it it. 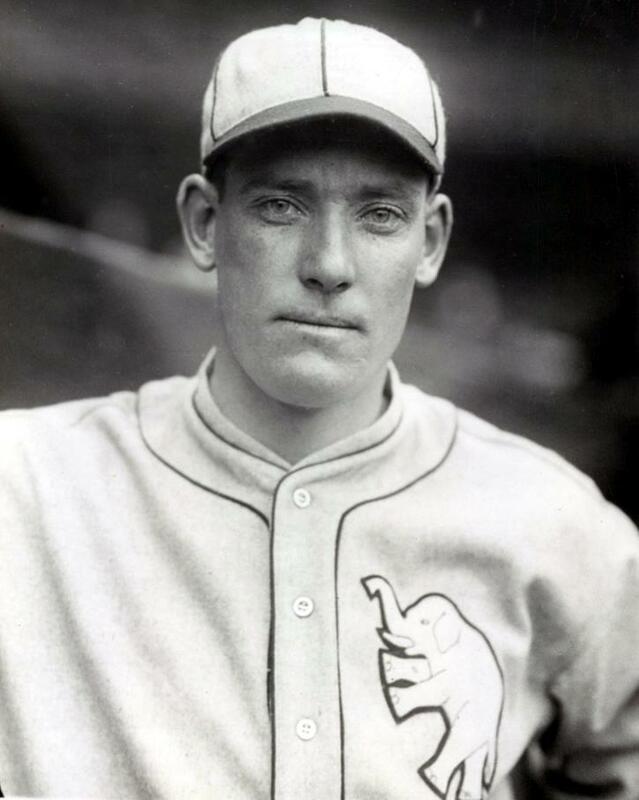 Anyway, BB still was secondary to baseball till one Fall day…which is another story; Tommy John probably was not even born yet much less the elbow surgery named for him. Spent my college years studying/math major; playing all sorts of BB in a great college gym and every other gym I could get into…and following my raging hormones lead. The 1950’s were no so innocent, at least in an urban area. To resume: re-looking at 1954/55, his first year back from the Marines. I believe the next 2 seasons show that the 21.0 ppg average of this year was the effect of the rust and lack of NBA game conditions (extra weight) from his 2 years away from the NBA. Why? First, the next year (1955/6) a lighter and in-shape Arizin averaged 24.2 ppg…good for second in the league and, was also second in the league in fg percentage. The Warriors won their division championship and the NBA championship. Arizin’s sparkling 29 ppg in the NBA playoffs led the Warriors. We can clearly see in the playoffs what he could do when he took more shots per game; took 23 FG attempts/game with a 45% fg percentage; 84% on fts. Second, the next season (1956/7), he averaged 25.6 ppg and won the NBA scoring title for the second time. Therefore 25 ppg seems about right, not 21.0, for 1954/1955 …giving Arizin, in 1954/5, 4 more ppg x 72 games: 288 more points. As said, in the 1956/7 season, Paul won his second scoring title at well over 25 ppg, and, as usual, placed in top ten both fg and ft percentage. The only off-note is that he was injured in the next-to-last season game and managed only 22 minutes and 9 points in the Warriors 2 (and done) playoff losses. Sad proof of his value to the team. Arizin played injured the next season 1957-8, missed some games and his scoring suffered; 20.7. From the looks of the tape job he wore for much of the season, possibly shin splints (OW!). Unfortunately, the only publicity glossies of him were taken that year. In one, he is throwing a jump pass…a nice shot.The other is one where he is taking a jump shot, facing the camera; a terrible picture as his legs are askew and one sort of is below the other…not how he shot the J, when uninjured, at all. In both glossies, his right leg is taped from inside the sneaker to almost his knee. I did see him in Phildelphia’s Convention Hall in his first game back from missing some games due to his injury…got 18 points (6 fg and 6 ft) against Celtics; Warriors lost. It was obvious that he was not the Arizin who was pain/injury free…but, still good. To be fair as injures are part of the game, we count this year’s totals “as is,” noting he managed 23.5 ppg in playoffs. 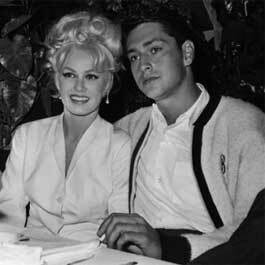 Arizin bounced back big-time in 1958/9, scoring at 26.4 ppg, his second (or, the way some stats are kept, third) time finishing second in the NBA in scoring; his 26.4 ppg was his highest scoring average ever…plus he took, for him, more shots than usual; 22 + fg attempts/game..again showing what he could do when he shot more often than his lifetime average of 18 fg attempts/game. Again, both his fg and ft percentages were in the top 10 for the league. Over the years, I had developed a relationship with Paul…began in 1980 or so when I wrote to him, like the long-time fan that I was. He kindly responded; seeming to be surprised that he got fan mail about 20 years after he retired..almost as if he was surprised anyone remembered him. Paul really liked tales of late blooming as to BB and that my jumper was the key to my scoring…and that I became a jump shooter because of him and his J. He also played service ball while in USMC and iterated that, with the military draft, service basketball then was high-level BB indeed. As said, I had a long lunch with Paul…sadly, only some 6 weeks before he suddenly died. We discussed many things some of which we had talked/written to each other about before; some things I refer to in this article, such as his only attempting a relatively low number compared to other high scorers. Remember that,over his career, Arizin averaged only 18 field goal attempts/game. I pressed him on this, citing years when such teamamtes/gunners as Joe Grabowski and Woody Saulsberry took almost as many shots per game, yet had scoring averages way below his. In the 1957/58 Season, Paul took 1,486 fga on his way to averaging 26.4 ppg…good for second in the league in scoring. Saulsberry took 1,380 shots, only 103 (just under 1 less per game than Arizin). Woody’s ppg average for the season? 15.4! Graboski hoisted up over 1,100 shots that year and averaged 14.7 ppg. But, Paul seemed never to have looked at it that way…he was a team player. When George Yardley broke the then-mythical 2,000 points in a regular season barrier, Red Auerbach said that, if Arizin took as many shots as Yardley, he would have scored many more points. High praise, but also cause to wonder what if Arizin was more “selfish,” looked for his shot just a little more? Or, had teamates willing to give up their shots so Paul could get more shots, score more and maybe help the team win more games. What did opposing players think about him? No secret that the key to beating Philly was clamping down on Paul. A typical Syracuse Nats locker room conversation was: OK, what makes Arizin click? His jump shot! How do we stop it? We can’t; he jumps so high and so hard…even though I have 4″ or 5″ on him says Red Rocha, or Dolph Schayes…I can’t stop it. Ken Sears of the NY Knicks who was somewhat of a defensive specialist at 6’9″ while in college, said he hated playing against Arizin. Why? Because he made me look as if I wasn’t trying! Both Walter Dukes and Ray Felix, seven-footers or close to that height, guarded the 6’4″ Arizin with little success. Sadly, very few motion pictures seem to exist which show him in game action. Seemingly in the 1950’s, the NBA had not, until the very late 1950’s, thought to film games. Even more to the point, in the program devoted to Arizin in the TV series on the all time, top 50 NBA players (called “NBA Basketballography” made in 2005) mainly has clips of him in his final 4 years. As noted, by then he had lost some to a lot of his leaping ability; this TV program is not representative of him in his salad years, say 1951/2 and 1955/56 through 1958/9. Even starting in 1954/5, he was not quite the leaper at 200+ pounds that he was in his first 2 years in the NBA. But, he could still sky with the best of them. Perhaps in some dusty file cabinet, storage bin of the old Philadelphia Warriors, such films exist. This is doubtful but to be devoutly wished for. Back to Paul’s NBA career. In 1959/1960, we find an Arizin that was aging (31 years old when that was old at the time for players), had expended a lot of effort the prior seaon…remember the 26.4 ppg and those 9 rebounds per game with the wear/tear under the boards. In 1959/59, he was the Warriors first and really only option. But, in 1959/60, Wilt Chamberlin arrived like a thunderbolt, scoring and rebounding far beyond any previous player. The result? 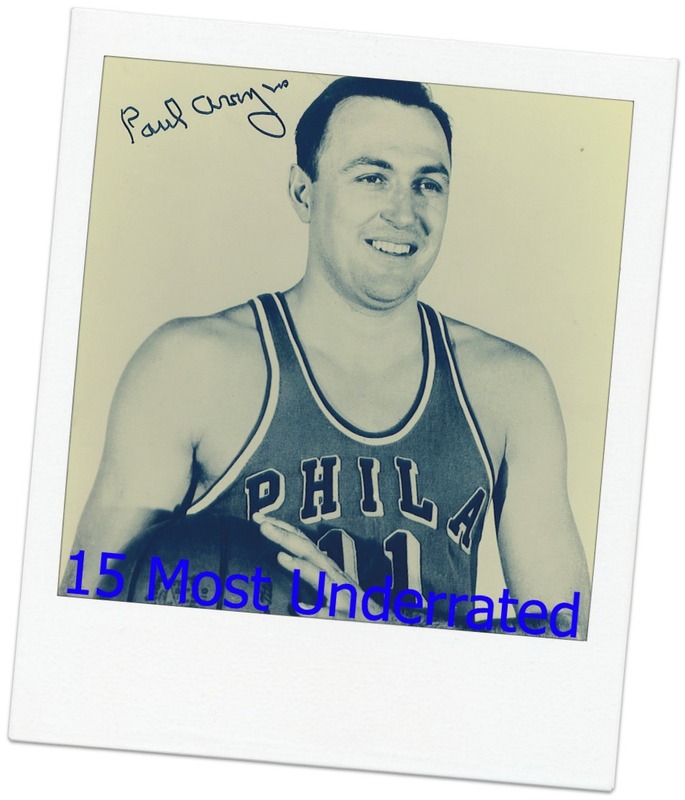 Paul still manages a respectable 22.3 ppg (8th in league) during the season but, when it counted, a sparkling 26.3 ppg in the playoffs; surpassed that year only by Chamberlain, Elgin Baylor and Dolph Schayes. In 1960/1, we see what should have been Arizin’s last hurrah; 23.2 ppg, good for 9th in league (Chamberlain averages over 38 ppg). But, the decline is evident; he leads league in personal fouls and his jumping ability has really fallen off. While he averages 23.3 ppg in the playoffs; his fg percentage is but 33% . The 1961/2 season in best ignored and/or forgotten. With a new coach who decides he is going to turn Wilt loose, Chamberlain averages an unheard of, spectular 50+ ppg as well as 100 in a single game. Arizin manages 21.9…mostly from memory and because Wilt gets tripled teamed. One moment comes to mind:Tom Heinsohn blocks an Arizin jumper while standing almost flat-footed. While Paul’s signature legs-folded jumper seemed there, the elevation was going (he is sometimes replaced by Tom Meschery in the playoffs), as are his rebound totals. He is playing out the string and being the competitor he is, probably knew he should have retired. The 1961/2 stats should be deleted because, IF Arizin had played in those missing 2 Marine Corps years and was in shape the next year, his first year back then: he would have retired after 1960/1, after 11 seasons, all as an All Star; 4 or more scoring titles, and almost 20,000 points with a 25+ ppg lifetime scoring average. This would have placed him, in 1960/1, as the most prolific point scorer in NBA history (Pettit and Baylor and Schayes, I believe were stll playing) and even today, 50 years later, as the 8th best ppg scorer (tied with The Big O) in NBA history. Had he been fortunate to play in even a part of the 3 point FG era …well, 2 or more 3-pointers per game on his one-hander would be a good estimate, with corresonding increase in average ppg. Mike, nationally yes, but locally no, and this list was specifically local. He is a man without a city. He has no number in the rafters and was never invited back to Sixers games. Understandable, since he wasn’t on the team, but it has allowed the city to forget that he’s one of the all-time greats, and the guy who essentially popularized the jump shot. If you asked 100 casual Philadelphia sports fans under age 40 what former Philadelphian popularized the jump shot, how many do you think would know the answer? 1, maybe 2? And if you asked those same 100 people who played center for the Warriors in 1962, how many would know? I think 50-60 is a fairly conservative answer. So there are two Hall of Famers who revolutionized the sport, and played on the exact same team at the exact same time: One of them is known by almost everyone and the other one is essentially unheard of. That’s what I call underrated. if you look at his secon year in the league…25.4 ppg..and realize he then spent what would have been two years where he should have scored even more (another scoring title or 2??) in the Marines and look at his first year back (fat and out of shape), you realize he would have had a lifetime average of 25ppg plus…and remember, he also played 3 years with Wilt. He is more than overlooked, he is truly underated!! If you guys love my grandfather so much, you should go check out his Facebook page, where a lot of his old quotes and pictures as well as newly found video’s are posted daily. Oh and don’t forget to like! In unveiling the most underrated and overrated Philadelphia Eagles of all time, one player from the Buddy Ryan-era Eagles of the 19 and appears on both lists.